The Sonnax patent pending pinless design with dual seals stabilizes the piston in the bore and provides better sealing characteristics. Use of this part eliminates the need for the pins. • Dual seals stabilize and completely seal the bore and provide a tight seal even after thousands of cycles. • Pinless design eliminates the possibility of pin leakage and the additional length stabilizes the piston to prevent piston cocking. • Steel balls included for plugging existing pin bore in valve body. In 4L60E, 4L65E, & 4L70E units it is common for the plastic forward accumulator piston to wear or crack. This causes a fluid loss, resulting is delayed engagement, slips, burned clutches and/or band. Repeated reciprocation of the accumulator piston causes the piston pin bore to wear. Fluid loss through the piston pin bore or cracks causes forward clutch to slip. 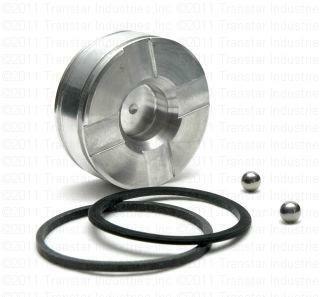 The Sonnax pinless forward accumulator piston kit 77987-01K eliminates these problems.